Four-Time Grammy Nominated Christian singer Matthew West recently took to the New York City subway with a live acoustic performance of his song, "Something Greater." West released his new album, All In on Sept. 22 and the musical project is being pegged "the most personal project he's done in years." The theme of the album is centered around what it looks like to devote one's life completely to the areas of faith, marriage, family, and the world. The singer took that "all in" mentality around the United States while promoting his new release and that led him to the New York City subway. 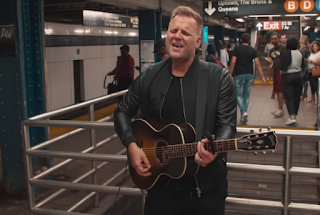 "There's something greater happening here ... yes, here, even in the New York City subway," West declared on Social Media along with a video performance of him singing one of his new songs. The Illinois native stood boldly at the 53st and 7ave station in between the B, D, and E subway lines. There's something greater happening here? We think we're in control but are we in control?